1. Cut brinjals into halves and then each piece in twos. Soak in salt water for half an hour and rinse before using. 2. Knead tamarind with 1 bowl water and strain out juice. 3. Heat 4 tbsp oil in pan and fry the sliced onion until soft and brown. 4. Add whole spices, ground garlic and ginger, tumeric and chilli powder. Fry until fragrant. 5. Add tamarind juice and seasoning to taste. Add brinjals and simmer till soft and gravy is thick. 1. Rinse mushrooms, remove stalks and cut each piece into 3 slices. 2. Heat oil in wok, saute minced garlic till fragrant, add sliced onions and fry till onions are soft. 3. Add sliced red chillies, mushrooms, seasoning and 1/2 cup water. 4. Continue to fry till mushrooms are cooked, adding more water if necessary. 1. Remove skin of jackfruit leaving pith and pulp with seeds intact. Cut into large chunks. ( Rub jackfruit with a little oil as it is cut to prevent sap from oozing out). Boil jackfruit in salted water for 10-15 minutes or until the fruit is tender. Drain and rinse with cold water. 2. Heat oil in wok over medium heat. Fry blended ingredients till fragrant. Add diluted coconut milk and jackfruit and simmer for 10-15 minutes. 3. Add prawns and simmer for 2 minutes. Add in thick coconut milk and season with salt to taste. 1. Wash eggplants and cut each into 3 pieces across and half lengthwise. Heat 2 tbsp oil in a wok. Put in the eggplants and cook over low heat, stirring occasionally until they are cooked through. 2. Wash and toast dried prawns for 5 minutes. Blend till fine and set aside. 3. Blend the chillies, garlic, shallots, tomatoes and belachan to a fine paste. 4. Heat 3 tbsp cooking oil in wok and stir-fry the blended ingredients over medium heat for 5 minutes. Add the dried prawns and stir-fry till cooked and fragrant. Add lime juice and adjust seasoning according to taste. If mixture is dry, add a little water. 5. When mixture is cooked, add in the fried eggplants and stir-fry for a while. 1. Shell shrimps, devein and wash clean. Wash sotong and cut into rings. 2. Cut beancurds into 2cm pieces, deep-fry till golden brown. Remove and place them on a serving plate. 3. Bring 250ml stock to a boil. Add in the seasoning, shrimps, sotong rings and crab meat. Add in the mixed peas and sliced red chillies. Thicken with thickening solution. 4. Turn off heat, pour in the egg whites. Stir mixture briefly and pour over the fried beancurds. 1. Place sea cucumber in a pot. Add in the spring onion, ginger slices, rice wine and 300ml water. Boil sea cucumber for 15-20 minutes to remove the fishy odour. Remove sea cucumber and cut into pieces. 2. Boil a pot of water with a pinch of salt and 1 tsp oil. When water is boiling, blanch the mushrooms and broccoli separately. Remove and drain well. 3. Place the sea cucumber, shitake mushrooms and 500ml water in a pot. Add in the seasoning and braise over low heat till gravy is quick dry. Adjust seasoning according to taste and add in the blanched button mushrooms, enoki mushrooms and broccoli. 4. Thicken with thickening solution. Stir well and dish up. 1. Cut taukwa into cubes and fry till brown. 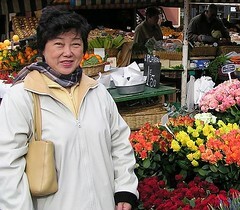 Cut chives (koo chai) into 2 cm lengths. 2. Heat oil in wok and fry the blended ingredients till fragrant. 3. Add in the crushed serai, prawns and seasoning. Fry until prawns are cooked. 4. Add in fried taukwa, taugeh, tomatoes and koo chai. Stir-fry for 3 minutes and dish up. 1. Wash mushrooms, pat dry and tear into small pieces. 2. Sieve flour, rice flour, custard powder and baking powder together. Add in enough water to form a batter of dropping consistency. 3. Dip mushroom pieces into batter and deep-fry in hot oil till golden. Drain off excess oil. 4. Heat wok, add butter and heat over medium heat till butter dissolves. Add curry leaves, chilli padi, sugar and salt and fry till fragrant. 5. Lower heat, gradually pour in beaten egg yolks from a height. Stir quickly with a pair of chopsticks till egg shreds are formed. Add in fried mushroom fritters and oats. Stir well and dish up. 1. Blanch all ingredients briefly in boiling water. Remove and drain. 2. Heat wok with oil and fry garlic till fragrant. Add in all other ingredients and seasoning and stir-fry till well mixed. Sprinkle with a little water and bring to a quick boil. Thicken with cornstarch solution. 1. Cut broccoli and cauliflower into bit-size pieces, rinse and blanch in boiling salted water for a second. remove and drain well. 2. Heat 2 tbsp oil and fry ginger slices till fragrant, add in gingko nuts, carrots and mushrooms. Stir-fry till aromatic. 3. Add in water and seasoning. Bring to a boil, lower heat and simmer until the gravy is almost thick. Add in blanched broccoli and cauliflower pieces, stir-fry for a while then thicken with a little cornflour solution. 1. Wash and cut long beans into thin rings, mince garlic, wash preserved radish and squeeze dry. 2. Beat eggs well with a fork, adding seasoning ingredients. Mix well and set aside. 3. 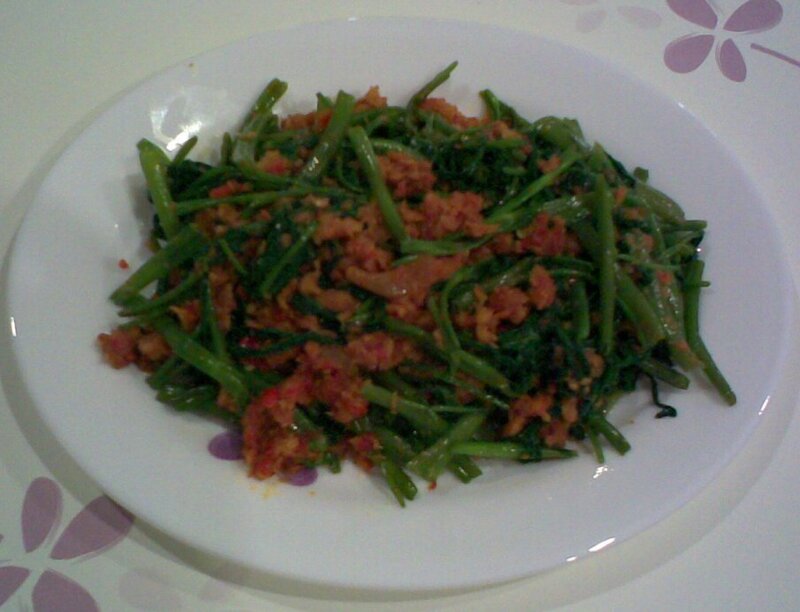 Heat wok with 2 tbsp oil and stir-fry minced garlic and preserved radish till fragrant. Remove and stir into the beaten eggs. 4. Heat wok with remaining 2 tbsp oil and stir-fry the long beans and sliced red chillies for 5 minutes. Pour in the egg mixture and cook over low heat until slightly brown. Turn over and cook other side until slightly brown. 1. Wash kangkong and snap the stalks at 2-4 leaves intervals, discarding the thicker parts of the stalks. 2. Heat oil in a wok and fry the chopped dried prawns until fragrant. Remove and set aside. 3. In the same oil, saute the spice paste until fragrant. Add in the kangkong and stir-fry till kangkong is cooked. Season with salt and the ikan bilis stock granules. 4. Dish up and sprinkle with fried dried prawns. 1. Slice the dried cuttlefish thinly, wash and rinse. Marinate with 2 tbsp vinegar and 1 tbsp sugar. Leave aside until softened, drain dry before frying. 2. Boil the meat until cooked, cool and cut into long thin slices. 3. 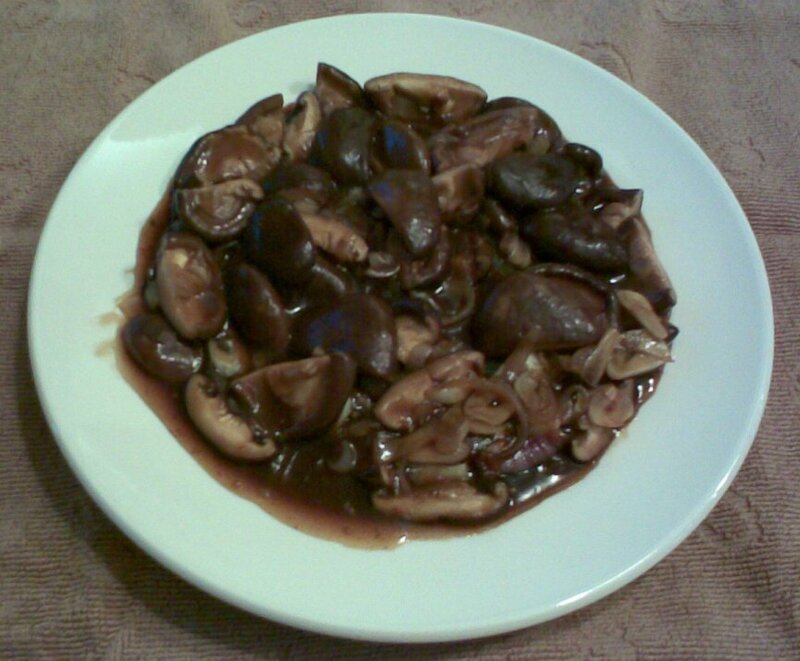 Soak mushrooms in water until softened and cut into thin strips. Slice turnip, carrots and cabbage thinly. Halve onions and cut into thin slices. 4. Heat oil in a wok over a medium fire to saute the minced garlic until fragrant. Add the cuttlefish and fry until it begins to pop. 5. Add in the onions and stir-fry for a few minutes more before adding in the mushrooms and the rest of the vegetables. Stir-fry until the vegetables are soft, then add in about 1 cup stock. Bring to the boil and simmer for 10 minutes, stirring occassionally. Season with light soya sauce, salt, sugar and pepper to taste. 6. Serve with lettuce and sambal belachan. 1. Marinate minced pork with 1/2 tsp salt, 1/2 tsp sugar, 1 tsp oil and 1 tbsp cornflour for 10 mins. 2. Heat the 2 tbsp oil in a wok. When hot, fry the garlic, chilli, ginger and the hot bean paste till fragrant. Add in the marinated minced pork and continue to fry for a while more. Sprinkle in 1 tsp chinese rice wine and 4 tbsp water. 3. Add in the bean curd cubes and seasoning. Leave to simmer over low heat for 2 minutes then thicken with cornflour thickening. Keep stirring for 2 minutes and add the chopped spring onions. 1. Heat 1 tbsp oil in wok and saute minced garlic till fragrant. Add in the remaining ingredients B and seasoning and stir-fry until fragrant, dish up. 2. Put beaten eggs into a steaming bowl, add in fried mixture and stir well. 3. Break salted egg on top of mixture and cover with plastic wrap. 4. Steam at low heat for 25 minutes or till cooked. 5. Garnish with chopped spring onions. 1. Wash angled loofah before paring the skin. Cut into slices and then into 5 mm strips. 2. Heat a wok with 2 tbsp cooking oil. Saute minced garlic and sliced ginger till fragrant. 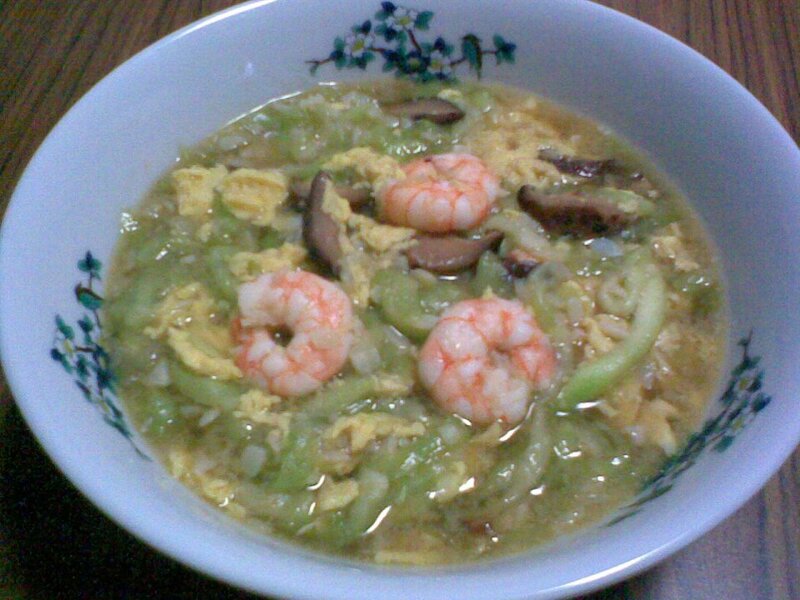 Add in mushroom slices and stir fry for a while before adding prawns and loofah. Cook till loofah becomes soft then add salt and oyster sauce. 3. Add crabmeat flakes and drizzle in beaten eggs. Turn off heat and let egg set well. Dish up and serve. 1) Grind shallots, dried chillies, garlic and blachan together. 2) Shell eggs, drain then fry in a little hot oil until brown. 3) Heat oil and fry grounded ingredients for a few minutes till aromatic. 4) Add assam juice, salt and sugar and crushed serai. 5) Arrange the fried eggs on a plate and pour the sambal gravy over it. 1. Shell ginko nuts, halve them and remove skin and bitter embryo in the centre. 2. Wash red dates and discard stone. Soak dried golden lilies, black mushrooms and cellophane noodles. Wash Tiensin cabbage and cut into 2 cm lengths. 3. 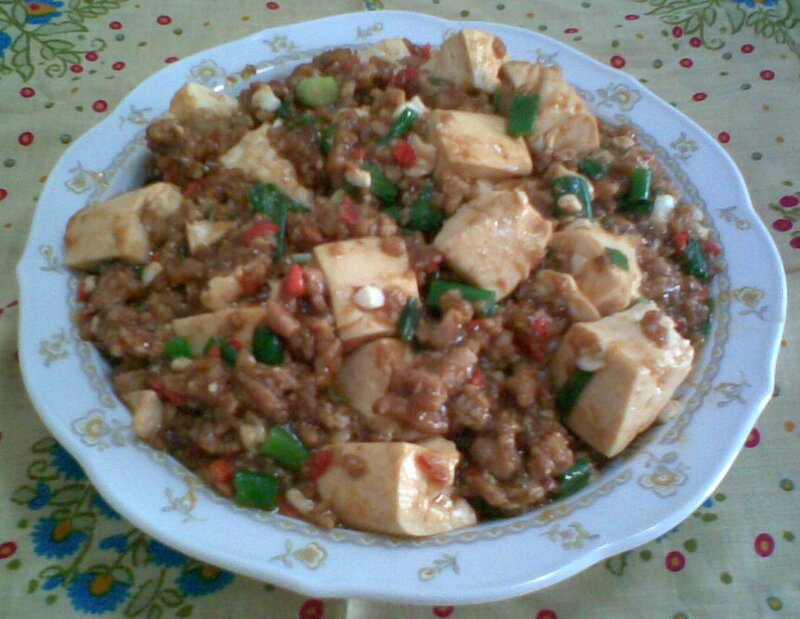 Place oil, chopped garlic and fermented red beancurd in a 24 cm casserole and microwave on power High for 3 mins. uncovered. 4. Add all other remaining ingredients and mix well evenly. Cover and microwave on power High for 61/2 mins.